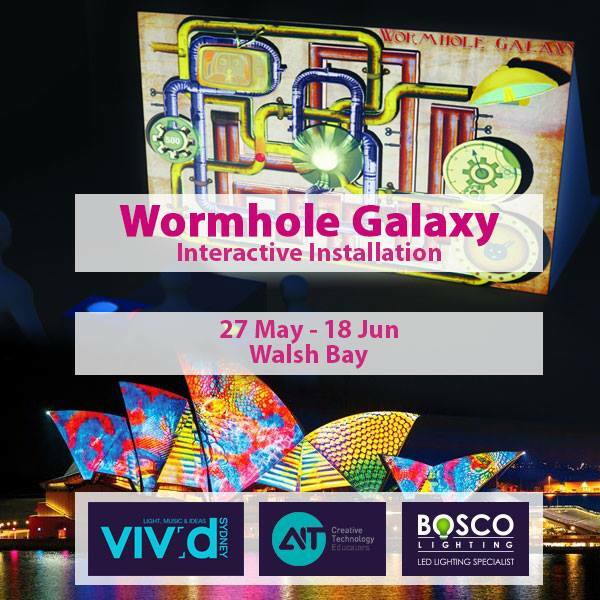 BoscoLighting is again proud to sponsor AIT with their VIVID Sydney 2016 interactive installation ‘Wormhole Galaxy’ at Walsh Bay 27 May - 18 Jun.Come and celebrate this wonderful event with us and of course, bring your friends and family as well! BoscoLighting’s involvement in VIVID Sydney is now in its second year and we are proud of our continued association, as well as the work of the artists and designers who utilise technology to bring light to our city. We look forward to seeing you, your friends and family at VIVID this year, it will be a great evening out! In the words of the artists, "Wormhole Galaxy is a playful, richly textured, interactive installation. It explores the concept of connection and collaboration within a ‘neon steampunk’ aesthetic, defined by the artists as ‘gritty textures meet futuristic three-dimensional technologies’. Participants of any age can enter the Wormhole Galaxy portal, to enjoy a pinball style contest. To collect bonus points, players have to work together to trigger animated designs hidden in hot spots within the game. The artists use the latest laser-cutting technology to create a three-dimensional screen, enabling the animated graphics to be projected with precision onto a carefully mapped surface. The result for the user is a collaborative game experience, played in a physical three-dimensional space."